Is Sierra Leone on the right track? 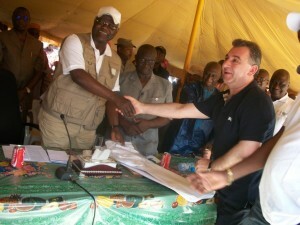 HomeNews in PerspectiveIs Sierra Leone on the right track? Where better for president Koroma to last week meet and address Sierra Leoneans living in Belgium, than the ‘one and only’ diamond City of Antwerp? Antwerp is the home of, and shop window into Sierra Leone’s best and most valuable natural resource – diamond. “Antwerp has a rich history and a leadership position as diamond capital of the world,” says Ludo Van Campenhout – Vice Mayor of Antwerp, responsible for the diamond sector. President Koroma was in good company. But where is the country heading? It is estimated that over $200 million worth of Sierra Leone’s precious stones are smuggled out of the country every year, making its way to Europe’s diamond mecca – Antwerp. Sierra Leone’s GDP per annum is about $3 billion, with average income per person not exceeding $600. Over 70% of the country’s population are living far below the globally acceptable standard of poverty. Sierra Leone’s bloody war, which lasted ten years, was fuelled by the illicit mining of what became known as ‘blood diamonds’. Over 200,000 people were killed, 5,000 amputated and 1 million uprooted from their homes – now living in the overpopulated capital – Freetown, as refugees. Despite the post-war resolutions by the United Nations, and international regulations demanding that all diamonds exported from Africa, must comply with acceptable standards of traceability certification, diamond smuggling is still rife in Sierra Leone. With corruption, the porosity of its borders and a poorly managed mining industry, Sierra Leone’s revenue from its natural resources remains appalling low. Th government’s poor performance has prompted critics and analysts, accusing it of taking the country back to the pre-war and grotesquely corrupt era, presided over by the same ruling APC party. But president Koroma is highly upbeat about his governance record, despite 23 out of 26 of his ministries – including the ministry of mines, failing to meet the government’s own performance benchmarks, set by president Koroma. “We are on the right track”. But whose track is he on, and where is the country heading? Taking much pride in what he refers to as his “open government” approach to governance, the president is reported have told his audience in Antwerp that he still believes in the notion, that ‘governance can be better when the governors create space for citizens to express themselves and their aspirations’, as he did in 2007. But the proof of that pudding is of course in the eating. The president is yet to make good his promise to give open and free access to government information, despite putting legislation in place, which could make this happen. The Freedom of Information Act is anything, but free access. The Agency and the information commissioner, prescribed by the legislation to act as the custodian of the Act, are nowhere to be seen. And it is this kind of sloppiness that gives credence to accusation of poor governance by government critics. 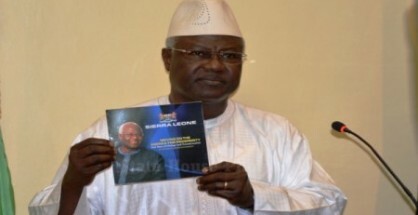 President Koroma told Sierra Leoneans in Belgium that ‘some people were sceptical about his desire to open up his administration to scrutiny by civil society and the opposition’. But is the failure of the president and a ‘selected few’ ministers to register their assets with the Anti-Corruption Commission, as well as publish this information, something to be proud about? Few in Sierra Leone believe the government’s transparency commitment. President Koroma said that he is ‘committed to be all embracing and inclusive, because he is President for everyone – including the opposition’. This will not go down too well with the 70% of young people in the country, that are yet to see the jobs emanating from the much touted 15% increase in GDP. Economic growth is not simply about the vast amount of iron ore (20 megatons in 2013) that is exported out of the country, largely by one single mining company – African Minerals Ltd., and the taxes that is paid to the government. It is most importantly, about the benefits of the economic growth to the country, and how those benefits are realised by all of the people of Sierra Leone, in terms of; employment opportunities, health care, improved standards of education, access to clean water and electricity, availability of cheaper food items in the markets, good standard of sanitation, and the availability of housing. The government’s Agenda for Prosperity which is regarded as the blueprint for taking Sierra Leone out of abject poverty, has been described by critics as nothing but a wish list, following the footsteps of its ‘late cousin’ – the Agenda for Change . Despite prioritising the provision of electricity, in a country regarded as one of the darkest in the world, the government is yet to make good its Agenda for Change promise to eradicate electricity poverty. Only 10% of households have access to electricity in Sierra Leone, according to World Bank report. But there are no ‘independent power providers or distributors’ in Sierra Leone. Electricity in Sierra Leone is generated and distributed by the government – a task which, successive government have found to be far beyond their capability and capacity, and compounded by corruption. Whilst ‘urging the private sector to get involved in the process’ of generating and distributing electricity in Sierra Leone may be the only viable option, question must be asked about the unpreparedness of the government to liberalise the industry. Where is the legislative instrument and the organisational programme management structure, that should be driving this vision and deliver its benefits? According to the president, ‘a National Grid is what is needed to ensure accessible and affordable electricity nationwide’. No one can dispute that, but what steps are being taken by the government in building the country’s dilapidated national electricity grid? The World Bank, British government and the EU are currently providing millions of dollars in funding, to develop transmission lines and distribution networks across the country, but there is very little evidence of this is being achieved. The minister responsible for the electricity sector and the senior management of the monopolised electricity authority, have recently been sacked, after massive corruption was unearthed by the funders. But president Koroma was honest in admitting that Sierra Leone needs about 1 gigawatts of electricity, in order to kick-start the country’s ailing economy, after six years in power. 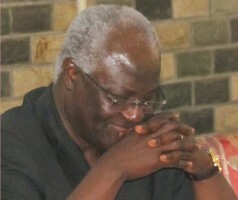 Although no mention was made of the recently awarded Dubai contract to establish a solar farm in Freetown, which could power thousands of homes, president Koroma talked about various mini-hydro projects planned for development across the country: Bikongoh, Bankasoka, Makali, and Charlotte. It is understood that the Chinese government will guarantee millions of dollars in loans, provided by Chinese companies to build those dams. As is fashionable for every government of Sierra Leone, claiming the prioritisation of agriculture as a key policy of government, president Koroma is no exception. But there are big problems. The government has been accused in various international human rights reports, of colluding and facilitating ‘land grab’ in poor communities, carried out by foreign companies. After fifty-three years of independence from colonial rule, Sierra Leone cannot afford to feed itself. Commercial farming for the manufacturing of bio-fuels has taken precedence over basic foods production. This farming strategy, president Koroma said, is vital for the ‘socio-economic development of Sierra Leone’, through what he refers to as the ‘National Sustainable Agricultural Development Programme’. Koroma said that several foreign investors are now in the country, making this shift to commercial agriculture a reality, such as: Scofin, Gold Tree, Sierra Aker, and Arul. 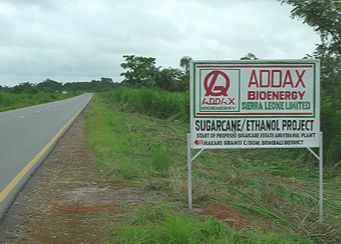 Other companies, such as Addax, are already in the process of up-scaling bio-fuel production in Sierra Leone, which the government say could provide jobs for hundreds of local people. Critics say that this policy will make local farmers become less dependent on farming for foods, and instead will soon join the army of village farm workers, ploughing the fields for fuel. But how patient are the people of Sierra Leone – especially the unemployed youth, with general and presidential elections just three years away? Is Sierra Leone on the right track, and where is it heading? Is Sierra Leone prepared for Ebola?